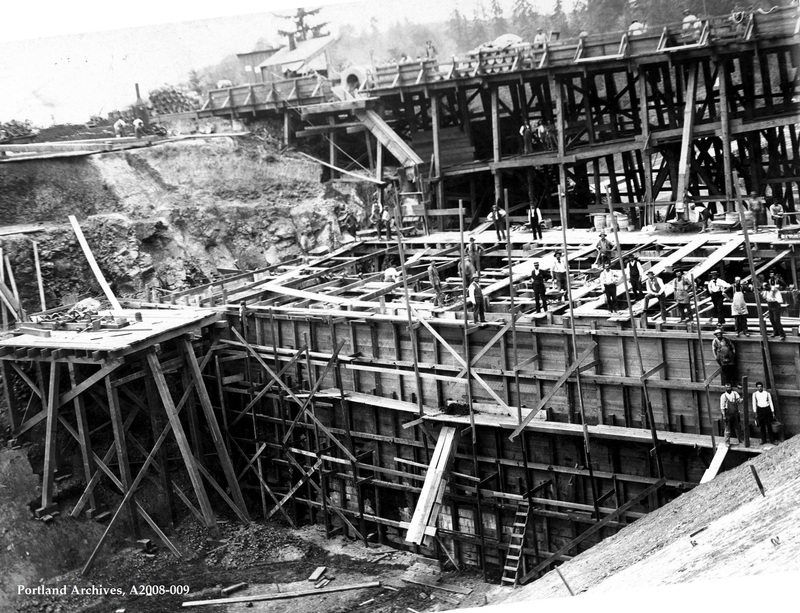 Construction on Reservoir 3, 1894. City of Portland (OR) Archives, Reservoir 3 construction, A2008-009, 1894. View this image in Efiles by clicking here. Holy Moly, this is a lot of timber and so much work! Wow! That is an impressive super structure for 1894.
make the resevoir seismically sound. Quite a large number of “skimmer” hats being worn in this photo. Looks like an old steam donkey on the left. Probably used for moving material?? Impressive. A salute to those men who worked so hard with what they had. Were told to hold up and pose for the camera on the hill. They knew it would be for those in the future to see. Here we are 125 years later doing just that. Two steam engines and a pile of wooden drums, empties too. If thats not the cement bag of the day for their two batchplants, They must have drank alot of whisky ! Does the fellow at center front have a giant waxed moustache? Dan Kidney on Help Us Out! Michael Damien Martin on Help Us Out! Ben Jurqunov on Help Us Out!